02.06.19 13:08	Account	Transfer	-100.00	Sent Payment: 100.00 USD to account U15826213 from U18691***. Batch: 245556214. Memo: Shopping Cart Payment. Invoice 1126, hyipcenter. 02.07.19 13:10	Account	Receive	+3.33	Received Payment 3.33 USD from account U15826213 to account U18691***. Batch: 245672118. Memo: API Payment. Invoice 1379, hyipcenter. 02.08.19 13:10	Account	Receive	+3.33	Received Payment 3.33 USD from account U15826213 to account U18691***. Batch: 245784047. Memo: API Payment. Invoice 1681, hyipcenter. 02.10.19 13:17	Account	Receive	+3.33	Received Payment 3.33 USD from account U15826213 to account U18691***. Batch: 245999131. Memo: API Payment. Invoice 2479, hyipcenter. 02.10.19 19:11	Account	Receive	+0.7	Received Payment 0.7 USD from account U15826213 to account U18691***. Batch: 246033718. Memo: API Payment. Invoice 2621, hyipcenter. The amount of 0.99 USD has been deposited to your account. Accounts: U15826213->U1*. Memo: API Payment. Invoice 4018, Ruslanis.. Date: 20:53 12.02.19. Batch: 246294088. 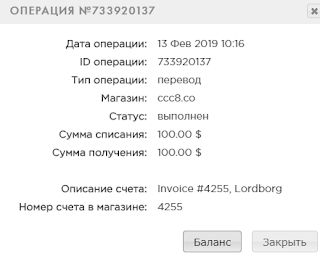 02.11.19 13:10	Account	Receive	+3.33	Received Payment 3.33 USD from account U15826213 to account U18691***. Batch: 246111322. Memo: API Payment. Invoice 2996, hyipcenter. 02.11.19 20:11	Account	Receive	+1.2	Received Payment 1.2 USD from account U15826213 to account U18691***. Batch: 246157339. Memo: API Payment. Invoice 3283, hyipcenter. 02.11.19 20:52	Account	Receive	+1.2	Received Payment 1.2 USD from account U15826213 to account U18691***. Batch: 246161172. Memo: API Payment. Invoice 3314, hyipcenter. 02.12.19 11:22	Account	Receive	+1.2	Received Payment 1.2 USD from account U15826213 to account U18691***. Batch: 246222965. Memo: API Payment. Invoice 3621, hyipcenter. 02.12.19 13:09	Account	Receive	+3.33	Received Payment 3.33 USD from account U15826213 to account U18691***. Batch: 246237124. Memo: API Payment. Invoice 3681, hyipcenter. The amount of 1 USD has been deposited to your account. Accounts: U15826213->U1*. Memo: API Payment. Invoice 4863, Ruslanis.. Date: 20:53 13.02.19. Batch: 246428220.